Wingate by Wyndham has expanded in three countries with 14 hotels. PARSIPPANY, NJ—Wyndham Hotels & Resorts is bolstering its network of midscale hotels and extending the global footprint of its Wingate by Wyndham brand with the recent opening of 14 locations across both hemispheres, including the first Wingate hotel in China and new additions to the brand’s established presence in the U.S. and Canada. The introduction of its first hotel in China, plus additions across the U.S. and British Columbia, Canada, brings the expanding brand’s global presence to nearly 170 hotels. As of June 30, 2018, Wingate’s global pipeline consisted of 74 hotels, nearly 60% of which were new-construction. Driving Wingate’s latest growth spurt in the U.S. is a newly signed franchise agreement with State Bank of Texas for 10 hotels across the Midwest and Northeast; the addition of an 80-room hotel in Moses Lake, WA, and the opening of the newly constructed, 123-room Wingate by Wyndham Nashville Airport, the brand’s first location in Nashville. The hotel reflects the brand’s design-driven prototype, created to meet travelers’ needs without skimping on services and amenities, while also lowering development costs and capturing greater efficiencies for hotel owners. This is the first of four Wingate hotels owned by Corinthian Development Company to open in the U.S., with locations under construction and set to open in the next year in Seattle; San Jose, CA; and Denver.The brand plans to add a newly built location in Long Island City, NY, in 2019. Wingate by Wyndham Sanya Luhuitou, located in China’s tropical island getaway in Hainan Province, is the brand’s first hotel in China and the Asia-Pacific region. With its temperate climate, the expansion of international flights, and greater visa-free access for tourists arriving to Hainan from more than 50 countries, tourism and demand in Sanya is on the rise making it a prime market for hotel development. Designed for vacationers reveling in China’s popular seaside destination, the newly constructed modern oasis has three outdoor pools, multiple bars and restaurants, a kids club with indoor and outdoor play areas, an extensive art collection, free WiFi and a 24/7 shuttle to nearby Dadonghai Beach. Wyndham plans to expand the Wingate brand further in China, with a 345-room hotel in Xining set to open in 2020. 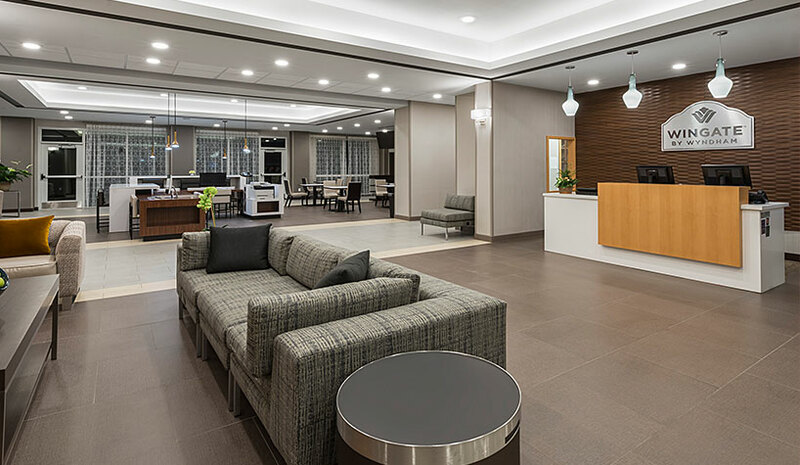 The addition of the brand’s latest Canadian destination—the 83-room Wingate by Wyndham Kamloops—marks the brand’s debut in British Columbia and widens its current footprint in the country to eight hotels. The newly constructed hotel has a modern design and natural earth tones; free hot breakfast and WiFi; an indoor pool and hot tub; a well-equipped fitness center; an on-site mart; and 750 sq. ft. of meeting space. Wyndham will continue adding to Wingate’s Canadian roster, having recently signed deals for two hotels in Lethbridge, Alberta, and Kanata, Ontario, expected to open in 2019 and 2020, respectively.